Food TV Cooking Club: August | Mmm, Tasty! So as you may recall, last month I made a grilled salmon and strawberry dish for the foodtv.ca cooking club. This month’s recipe is a bit less adventurous: pancakes. We already have a good pancake recipe in our household, but I decided to give these a try anyway. Besides, they’re from the book Eat, Shrink and Be Merry, which I’d heard about for ages as a good resource for delicious, healthy recipes. 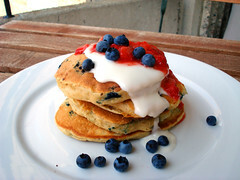 The recipe had two components: the pancakes themselves, which contained fresh blueberries, and a strawberry-orange sauce. We picked up local blueberries and strawberries from a vendor in the Byward Market on Saturday, just so we could make these pancakes. The verdict? The pancakes were very good. They took almost no time to make and had a fluffy texture with just the right amount of blueberries. They were also good and ‘hearty’ so you aren’t left feeling hungry after eating a few of them. The strawberry sauce, however, wasn’t as good as I’d hoped. I found it had too much orange flavour, which overpowered the light and sweet strawberries. I’d probably make these again, but only if I’m craving blueberry pancakes. Otherwise I’ll stick to our tried and true standard recipe. Carbs and greens and spices, oh my!